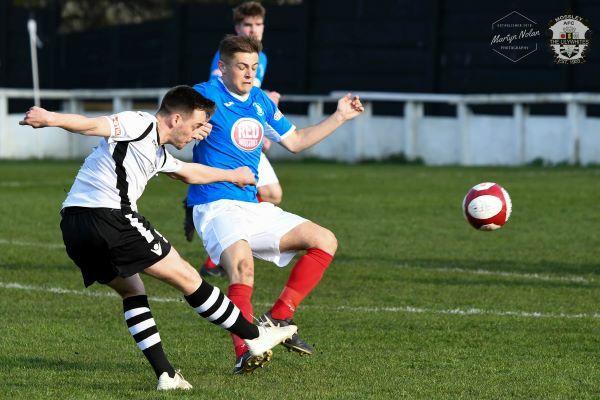 Mossley provided the perfect response to the defeat at Kidsgrove with an impressively dominant performance despite winning on 1-0 against Newcastle Town at Seel Park on Saturday. Ben Halfacre and Kieran Nolan returned to the starting line up in place of Raul Correia and Mike Fish who were named on the bench as the formation was also slightly tweeked. The Lilywhites took control from early in the game and never let go, dominating possession in all the right areas, closing down when out of possession and quick ball recovery were all features of a confident and commanding display. Mossley had a great chance before the 10th minute mark when Ben Halfacre turned his effort wide from Dieter Downey’s low cross. Despite their dominance the Lilywhites had to wait until the 23rd minute for their next clear opportunity and this time took full advantage. Andy Keogh’s pinpoint pass sent Downey scampering down the left wing and his cross was brilliantly stroked into the far top corner of the net by Max Leonard for his 20th goal of the season. Godwin Abadaki was a whisker away from doubling the lead a few minutes later after good work by Keogh and Halfacre and Max Leonard’s 25 yarder flew inches wide as Mossley regularly cut into the heart of the Newcastle defence. Mossley continued to dominate after the break but it was Newcastle who had the first chance but Josh Ollerenshaw tipped over Jordan Cole’s effort. Leonard had the ball in the net but the assistant’s flag was raised and more Mossley opportunities followed for Halfacre, Leonard, Keogh and substitute Raul Correia before Keogh had the ball in the net again but again the assistant’s flag ruled it out for a more dubious off-side. The Lilywhites played the remaining minutes out extremely well with Newcastle allowed nothing in the way of opportunities to find a leveller.